Appreciate Your Trees | What's Green with Betsy?!? 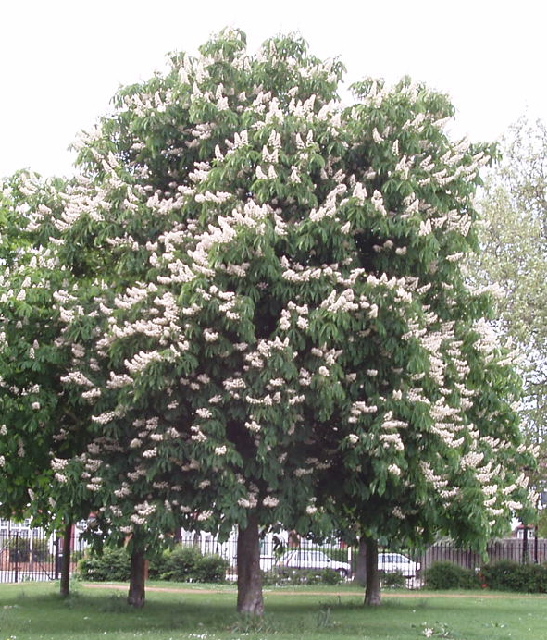 Don’t think I’ve ever seen a horse chestnut tree but it is a beautiful tree. I have no trees of my own. The park owns the trees behind me and lets nature take it’s course. Do have a few sickly looking Arbor Vita that I fed compost last summer. Will do again this year. Hope it helps. They were not taken care of before I moved here. Good for you. It feels so good to take care of a sick tree and watch it respond. Thanks for being a faithful reader and for your comments. Beautiful tree. I don’t think I’ve ever seen one either. We rake our leaves around the base of all our trees and when I mow, I spray the grass toward the base of the trees. They seem to love it. By the way, we bought a log cabin in the North Carolina mountains and look forward to being surrounded by mountains covered in trees. How fabulous! I love that area. We were in Asheville last year and I fell in love! Where is your cabin? By the way, I’m so glad you are doing “Book Review Friday”! I’m a little lax with my reviews, but hope things will settle down when the move is over and I can concentrate on my #2 and #3 loves: writing and reading. We are two hours west of Ashville, close to both Georgia and Tennessee. About an hour south of national park.